The Umbrella Workshop offers a vast number of umbrellas for branding, including various options manufactured here in Britain. Do you need branded umbrellas printed quickly? Is British manufacture an essential part of your brand? Simply want to save on shipping? The Umbrella Workshop can create both golf sport and city walking style umbrellas customised with your own eye catching design. Take a look around our printed umbrella gallery for some examples of what we can do. 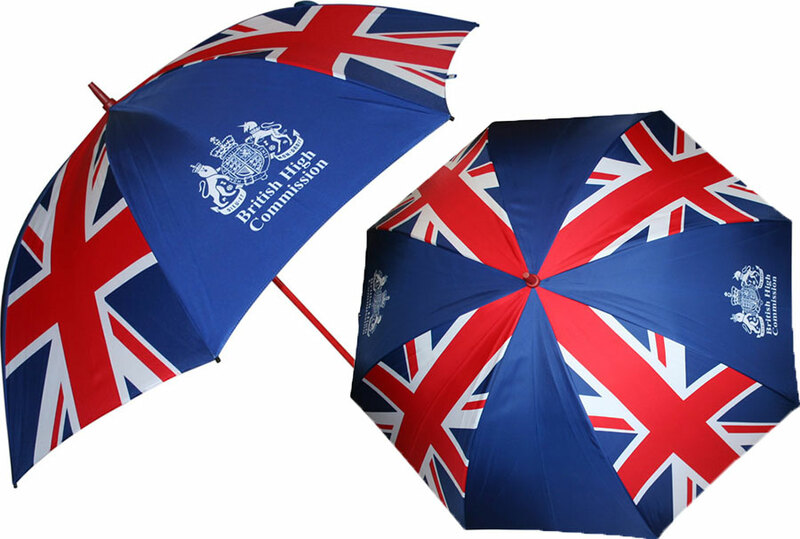 We’ve produced high quality umbrellas just like these for clients including the British Embassy. Our own Umbrella Workshop branded umbrellas are also printed and manufactured in Britain! Manufacturing in Britain has many advantages, depending on your product spec, with the potential to reduce both turnaround time and shipping costs, as well as helping to protect jobs in the UK and create new ones. Urgent order to place? Contact us now with your specifications and we can advise you on the design options available. All our umbrellas come with a two year guarantee as standard. Visit our sister site The Bag Workshop for information on creating promotional bags and Wurlin for details of other printed promotional items available.